So, apparently Rooster Cogburn is doing his job. And one of our old hens did her job and actually began sitting on the eggs! I was still skeptical, don’t ask me why. I just didn’t think we would get any chicks. 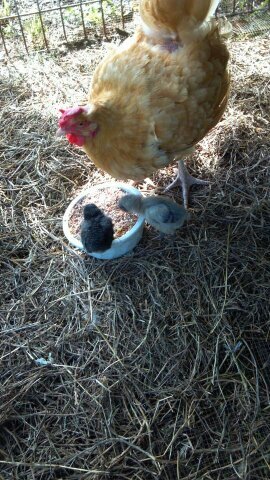 Imagine my surprise when I was walking past the chicken coop last week and heard a tiny “Cheep!” I peaked in, and sure enough, two tiny chicks were following their mama around! Gage moved the hen, chicks, and the rest of the eggs into a separate coop, hoping she would hatch the rest. But she was too distracted with caring for her two new babies, and didn’t get any more (actually a few more hatched, but didn’t survive).